While any dog can be trained to do detective work, (my rescue-guy knows of a chihuahua currently being trained!) German Shepherds are pretty typical because of their intimidating appearance. One day I’ll re-do the “Husky” block to look more like our new dog, Maya, who is red and white, and I’ll even add the word “Siberian” on the side because we found out that owners prefer to call them “Siberians” to differentiate them from the larger and stronger (but not faster!) original Alaskan sled dogs that were nicknamed “huskies”. What did I know? I’m smarter now. Our dog at the time, “S” for Samoyed, was Malachi, who went to romp in the daisies last summer at the ripe old age of 3-days-short-of-16. Fantastico! 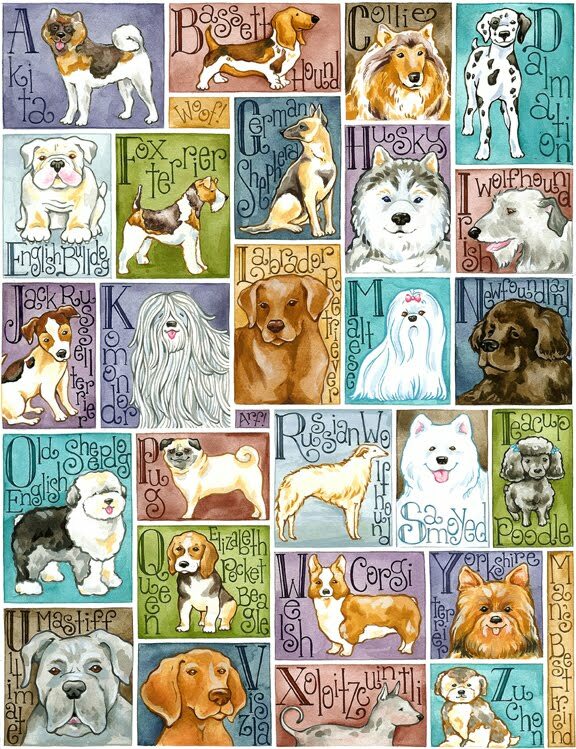 Little doggies, the ULTIMATE alphabet! Oh, girlfriend, I will sing my ABCs over and over and over as long as you keep making these. These should be the latest postage stamps, don’t you think???? It sure would boost the number of people sending snail mail. Wooohooo! How is it that I am just now finding you…?? LOVE your work, my goodness, it is so cute and so well designed and rendered. I love alphabets too and this one for pups is GREAT! Love your holiday one too!! Top it all off with the fact that you are a Believer who is not afraid to share openly and I’m hooked!! Have a glorious, creative week in Him! SO nice to meet you! Hello my dear – Yes, I too have awarded you one of those pesky awards! HA! I love this, one of my favourite shows on SBS here is Inspector Rex (in German of course Komisar Rex, I don’t speak German so I have to read the subtitles for the kids). He of course is a police dog always on the case! Okay, where can I get this beautiful piece of work???? Fabulous design of the page!! GOD IS BIG IN YOU!!!! I love it. Hi Krista, I like how you are thinking. You have wonderful design sense, in how you fill up the page and get the composition working. Wow, your dog alphabet it´s truly amazing. I love it! Love this, especially the shepherd as I have a lovely one! Awesome shepard. My daughters dog is a German Shepard cross and he is wonderful. 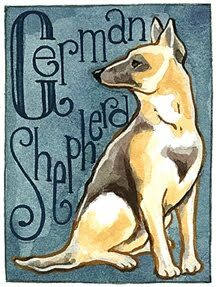 Lovely illustration and I would love it even if I didn’t really really love shepards. Oh love all those doggies – they add so much to our lives, beautiful my friend! You are amazing. I don’t see how you are able to incorporate so much detail. Your drawings are phenomenal! A fantastic execution of the theme and your alphabet dogs are magnificent. The Naples version at the Museo di Capolodimonte in Naples. This is beautiful Krista, I love all the different dogs. What a nice idea for an alphabet collage. I think the Dalmatian is my favorite one though. Hey Krista! Before I read your paragraph, the Samoyed caught my eye. So beautiful. I never knew there was an X dog. :o) You are truly one talented gal my friend! We have a pomeranian I see you used the pug for P. My daughter has a black one… his name is Jack. Whenever I’m at there house, I’m always answering when they call him. Great idea with the German Shepherd for detective. And so beautifully done! Wonderful work! And again so many details to get lost in! That is a really awesome series…nice to see work that inspires new ideas! Beautifully done!! All of them. I love this whole concept! Beautifully rendered! I’m such a sucker for animals of all kinds and you have really done these puppers great justice! Gosh! Two in a day! I am going to lie down. Your work is truly outstanding. I was looking for my Daisy but she is just like me – a mutt. HAHAHAHA! Have a great day. I entered this little ditty in the contest over at Spoonflower. What fun to spend an afternoon playing with crayons!